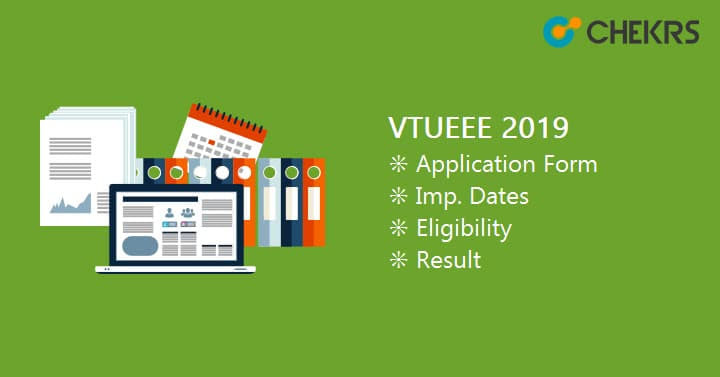 VTUEEE 2019: The VTUEEE is the name of Vel Tech University admission process. The university has its main campus in Chennai. Engineering studies in the colleges are best among others. VTUEEE stands for Vel Tech University Engineering Entrance Exam. As the name suggests, enrollment for engineering courses at UG level can be taken through the exam gateway. If you are also interested in the exam, follow the information shared here and learn the essentials of VTU university application for, VTUEEE 2019 Exam Date, eligibility to apply, exam pattern and all other post exam details. As mentioned, the admission procedure of VTU Engineering Exam is different from others. Thus the dates and occurrence of complete events are likely to be different. Here is the list of the event through which one can catch-up all phases of taking admission. The university offers admissions through the exam and direct as well. However, mentioned eligibility criteria are mandatory for all to be followed for taking admission. Here we are listing down VTU Admission Eligibility for B.Tech courses through which one can know what standard needs to be matched. Lateral Admission Applicants should have done Diploma in Engineering / Technology in relevant branch from recognized institution The students who have gained the degree in Science (B.Sc.) (10+2+3 stream) and had Mathematics as a subject up to H.Sc. The application form submission of the university begins quite early and it is important for each one to process it timely. The VTUEEE Application Form 2019 can be submitted online and offline both as per convenience. However, interested candidates can find relevant information for both processes here. Once the link is made available, following steps have to be followed by applicants. Submit all details asked in the application form as per given instructions. Once done, pay the application fee through DD and send it to the registered address. Open the link specified by us. Register on the website and access the application form. Once done, log in and proceed to fill the online application form. Submit details as required and recheck them. Complete the last process by filling online application fee. Your application has been submitted successfully after this process. Documents Required: Colored passport size photograph & signature of size limited to 100 KB. The VTUEEE Exam Pattern is mandatory for all who are seeking to prepare themselves timely. Referring to the exam pattern helps make strategy and know how to prepare and how to formulate practice sessions accordingly. Here we have mentioned the VTU B.Tech Exam Pattern through which priorities can be known. The syllabus is one of the most important factors for all those who want their selection. As it is the national exam, the raised competition can make it difficult for one to qualify. For all such conditions, VTU B Tech Syllabus will help one and all to know what important topics that shouldn’t be missed are. All applicants can stay relaxed as we will be providing pdf as per changing patterns. Here is the VTUEEE Syllabus Pdf available for all students through preparation of major subjects can be done. The examination is taken in both modes, online and offline. Thus, VTUEEE Hall Ticket for all is the only source through which one can know valuable information of exam. Those applicants who would have chosen online exam as their selection method can opt method of slot booking. Through the VTUEEE Slot Booking, it is possible for students to accommodate the timings they wish to. On the other hand, students who have taken offline method will have to download their VTUEEE 2019 Admit Card after the availability of link. From here, downloading it will be easy and simple. The results of the exam taken both online and offline will be released. The date of result announcement will be same for all streams. Even the students who have given offline examination will have to check their result online only. It is more manageable and easy for students to check out their VTUEEE Result 2019 through updates provided by us.